Update brings better usability features: Google Play. 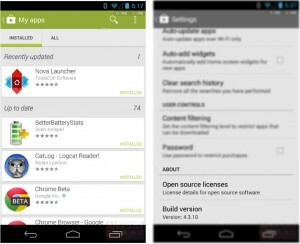 The Google Play Store gets a new update. Again. But they didn’t fix any of the issues we’ve beencomplaining about. The new features introduced with version 4.3.10 have primarily one goal: more clarity for the user. One of the main ways they’ve set out to achieve better usability is to include a new area that informs the user of all recently updated apps. The new Play Store changes are almost all in the “My Apps” section, where we find a list of all apps the user has installed on any of their Android devices. If there are updates available for any of these apps, those apps are now listed under a new top-most section called “Updates”. It is now also the area where all apps that have been ”Recently Updated” are found. This is especially useful if you have many apps installed and have lost track of which apps are due for updates and what you’ve already updated. Another user-friendly feature for smartphones users is available in the Google Play Store now, which you will immediately notice in your notifications bar. From now on, every single app won’t have its own message to let you know it has been “Updated”. Instead, all new updates will be summarized in a single notification message. Very practical. I never even read the updates before, just swiped them away into oblivion like flies off my dinner. Other minor changes to the Play Store include a pricing change to Play Books so you can see discounted prices and other mildly interesting changes. A detailed list can be found at Android Police. There too, you can get the APK, if you just can’t wait for the official update. What do you think of these changes? Why do you think Google didn’t fix any of the issues users have been complaining about from the last update? Do you think they will?